12 week results from the SUmiT Trial: percutaneous tibial nerve stimulation vs validated sham in those exposed to pharmacologic therapy. Peters, K., et al. (2010). Poster, International Continence Society, Toronto, Canada. HYPOTHESIS / AIMS OF STUDY: Neuromodulation therapy uses electrical stimulation to target specific nerves in the sacral plexus that control bladder function. Urgent® PC (Uroplasty, Minnetonka, MN) percutaneous tibial nerve stimulation (PTNS) targets the sacral plexus from an accessible, minimally invasive entry point into the nervous system – the posterior tibial nerve. Pharmacologic treatment is standard therapy, but the high incidence of side effects, relatively modest improvement, and poor adherence to treatment limit its efficacy. The objective of this review is to compare the efficacy of PTNS to a validated sham in subjects who have previously used OAB pharmacologic therapy. STUDY DESIGN, MATERIALS AND METHODS: This multi-center, double-blinded trial enrolled 220 subjects; 110 randomized to PTNS, and 110 randomized to a validated sham intervention . Sample size estimates of approximately 214 subjects, 107 per study arm, was calculated using a 2-sided Fisher’s exact binomial test based on an estimated 60% responder rate in the PTNS group and a 40% responder rate in the sham group with a 5% significance level and 80% power. This analysis includes only those subjects who previously used OAB pharmacologic therapy prior to their participation in the study; 68.1% (150/220) subjects, 73 randomized to PTNS and 77 to sham. Duration of therapy varied across subjects and across medications; however overall mean duration was similar between groups; 16.2 months in PTNS group (0.3 mo min, 97.0 mo max) and 15.6 months in sham group (0.3 mo min, 168 mo max). Subjects and study coordinators were blinded to the intervention. Voiding diaries and validated questionnaires were completed at baseline and after 6 and 12 interventions. PTNS stimulation was delivered through a 34-gauge needle electrode inserted near the posterior tibial nerve using the Urgent PC device for 12 weekly 30-minute sessions. A surface electrode and 2 sham electrode pads were placed for consistency with the sham. The validated sham intervention used a Streitberger placebo needle that provided the sensation of a needle, but did not pierce the skin as it retracted into its shaft. Also, TENS electrode pads were placed above and below the small toe providing the sensation of stimulation without tibial nerve activation. An inactive surface electrode was placed as in PTNS. Additionally, the audible PTNS device sounds were reproduced in the sham intervention to diminish auditory variation between groups. RESULTS: The GRA found 62.9% (44/70) were responders (moderately or markedly improved) in the PTNS group compared to 20.3% (15/74) in the sham group (p<0.001). 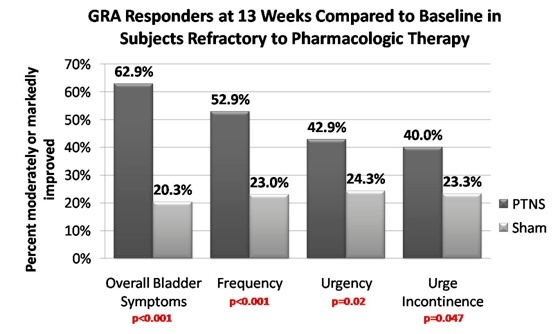 The PTNS group also had statistically significant improvement for urinary frequency, urgency, and urge incontinence on the GRA compared to sham group (p<0.05), see figure. Voiding diary parameters after 12 weeks found that the PTNS group had statistically significant improvement compared to sham for frequency, nighttime voids, urge incontinence and moderate to severe urgency. The OAB-q Health Related Quality of Life (HRQL) questionnaire was statistically significant for improvement in the PTNS group compared to the sham group (p<0.01). No serious adverse effects were noted in either group. INTERPRETATION OF RESULTS: The results of this cohort provides strong scientific evidence that the therapeutic effect of PTNS is due to the stimulation of the posterior tibial nerve and is not due to a placebo effect and is effective in those previously exposed to pharmacological treatment. By comparison, GRA results for subjects regardless of previous pharmacologic treatment found 58.3% (60/103) were responders in the PTNS group compared to 21.9% (23/105) in the sham group (p<0.001) . Both of these results further affirm the therapeutic effect of PTNS when used in subjects with OAB, regardless of prior pharmacologic therapy modalities. CONCLUDING MESSAGE: This multicenter, double-blind, randomized, sham controlled trial provides level I clinical evidence that PTNS therapy is safe and effective in treating OAB symptoms in those exposed to pharmacologic treatment. The compelling efficacy of PTNS as demonstrated in this trial, along with other recently published reports, should have a significant impact on the clinical management of OAB [1-3]. Peters KM, Carrico DJ, Perez-Marrero RA, Khan AU, Wooldridge LS, Davis GL and MacDiarmid SA: Randomized Trial of Percutaneous Tibial Nerve Stimulation Versus Sham Efficacy in the Treatment of Overactive Bladder Syndrome: Results From the SUmiT Trial. J Urol. 183: 1438-1443, 2010. Peters KM, MacDiarmid SA, Wooldridge LS, Leong FC, Shobeiri SA, Rovner ES, Siegel SW, Tate SB, Jarnagin BK, Rosenblatt PL et al. : Randomized trial of percutaneous tibial nerve stimulation versus extended-release tolterodine: results from the overactive bladder innovative therapy trial. J Urol. 182: 1055-61, 2009. MacDiarmid SA, Peters KM, Shobeiri SA, Wooldridge LS, Rovner ES, Leong FC, Siegel SW, Tate SB and Feagins BA: Long-Term Durability of Percutaneous Tibial Nerve Stimulation for the Treatment of Overactive Bladder. J Urol. 183: 234-240, 2009.